It can be difficult to trade when the market gets overheated. On the one hand, stock prices can become absurdly overpriced, which gives traders fear that prices will pull back; on the other the fact that stock prices are rising creates envy, which makes them attractive for buyers. 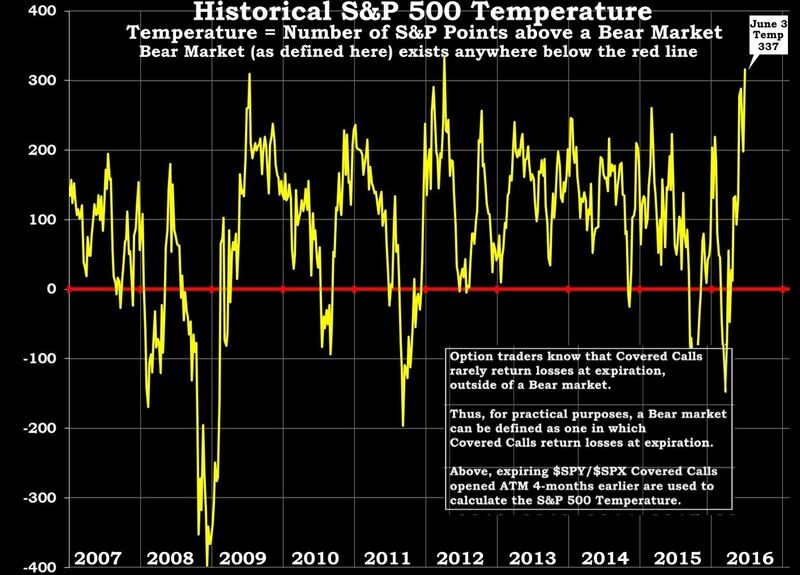 One method of determining whether stock prices are truly reaching a top is to look at the S&P 500 Temperature. Typically, the S&P rarely reaches a Temperature of 300 (meaning it’s 300 points above the level that tends to divide bullish sentiment from bearish). Sentiment over the past decades has tended to correlate with the performance of certain option trades known as 4-month-out at-the-money Covered Calls. Essentially, when these trades are profitable at expiration, traders tend to be in a bullish buying mood; and when the trades fail, traders tend to feel bearish. The Covered-Call break-even point has been a long-standing reliable indicator of the dividing line between the Bulls and the Bears. 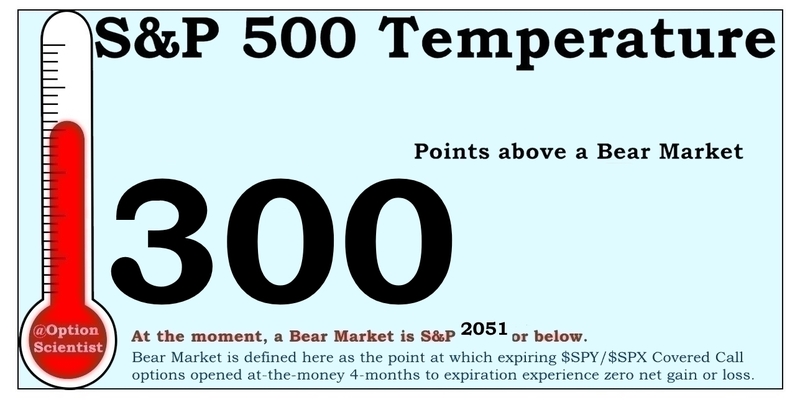 The Temperature of the S&P can be determined by calculating how many points it would have to fall in order for traders to start to feel bearish in mass quantities. It is very rare that the S&P has been 300 points above that level. The Dow is similarly positioned, and though not calculated here, is likely 3000 points above the area that would be considered bearish. Sentiment is clearly bullish at the current time. But bullishness has its limits. When the Temperature gets over 300, as it has only done approximately three times in the past ten years, the fear of hitting a top can cause some strange effects in stock prices. Despite the market being overheated, some traders will inevitably take their profits and walk away. When they sell their stock to take their profits, they can set off a downward spiral that cascades in a chain reaction of selling among other traders, and that can sometimes bring the S&P down in a hurry. But given that the market is smoking hot right now, there are also many traders just waiting for a small dip to buy stocks. The end result is that at a Temperature of 300, daily price swings can become much larger. Some folks are looking to call a top and sell, while others, who believe the rally will continue, are looking for the slightest opportunity to buy-the-dip. The difficulty for traders in market environments such as this is that these events don’t occur very often. That makes it difficult to back-test any strategy that might make enduring this environment profitable. The historic data is too sparse to be reliable. The market could get so hot that it gets exhausted and needs to cool off, or it might be so hot that nothing can cool it off anytime soon. Traders who have experience trading in past environments when the Temperature was over 300 might do well now, but those who have never been here before would do best to heed the warning the options analysis is yelling “this is not your ordinary trading environment“.